Love the look of solid oak furniture but not so keen on the price tag? We've got a solution! With an Oak World voucher code you can enjoy amazing savings on a wide range of oak furniture for every room in your home. So whether you want to update your bedroom with a gorgeous oak wardrobe or deck out your kitchen with oak units, cabinets, tables and more, an Oak World voucher will help you get your dream home for less. At Oak World, they have over 25 years' experience in the furniture business – so they really know what they're talking about when it comes to offering quality, well-made products at great prices. In fact, they're one of the leading online retailers of high quality solid oak furniture in the UK. A family run business based in the North East of England, Oak World supplies the finest European solid oak furniture direct from the factory. Because they cut out the middle man, they are able to pass their savings straight on to the customer and offer some of the most competitive prices around. And because they buy in volume by the container-load, there are further savings which translate into even better bargains for their customers. At Oak World they believe that customer service is just as important as the quality of the furniture they supply, and always strive to provide the very best customer experience from start to finish. So if you can't find exactly what you're looking for, their dedicated team of expert staff will do their very best to help. Oak World's comprehensive online store offers customers the chance to browse a huge range of solid oak furniture, from desks and office cabinets to wardrobes, bedside tables, kitchen tables and more. Want a new look for your living room? Their solid oak cabinets are ideal for hiding away ugly electronics and adding an elegant touch to any space. Or perhaps you're bored with your old kitchen and want something a little different? Solid oak units and sideboards are a great way to update a tired room and create something fresh and beautiful. Whatever you're looking for, Oak World's extensive collection of designs is sure to offer something to suit every budget and taste. Want to get shopping with Oak World? With an Oak World voucher code you can enjoy great savings on their wide range of stylish and affordable furniture. So whether you're revamping your whole home or just in the market for a new table and chairs, Oak World voucher codes will save you money while you shop. Browse our website until you find an Oak World voucher code that suits you, then navigate to their website to begin shopping. Enter your Oak World voucher in the box provided and click 'Validate code'. If you've enjoyed shopping at Oak World, you might also like to check out more great deals on furniture at stores like Made or B&Q. Or, if those aren't up your street, you'll find plenty more deals to browse in our Home and Garden section. In category Home & Garden there are lots of online stores such as Oak Furniture Land. We especially recommend coupons and voucher codes to online stores such as Oakworth furniture, WorldStores . Enter your Oak World voucher code in the box provided and click 'Validate code'. Standard UK delivery is free on all orders over £399. For orders under £399, a delivery charge of £40 applies. If you need to return a product for any reason to Oak World, you can do so by simply telephoning the company within 30 days of receipt to arrange for your item to be collected. Need to contact the team at Oak World? Whether you have a question about your order, want some expert advice on choosing the right furniture or simply want to find out more about how you could make big savings with an Oak World voucher, you can contact the Customer Services department by telephoning 01388 747090. Want to find out more about beautiful oak furniture with Oak World? Why not follow the company across your favourite social media sites? You'll find lots of exclusive content including promotions, new collection previews, industry news and more. You can also use these pages to find out more about saving money with Oak World voucher codes. Don’t forget to check them regularly, as you can never be sure when a free Oak World discount code might be waiting for you! Buy now online at www.oakworld.co.uk. When we did up our home, I really wanted a solid oak dining table – but I didn't think our budget would stretch that far. Then I found an Oak World voucher code online! 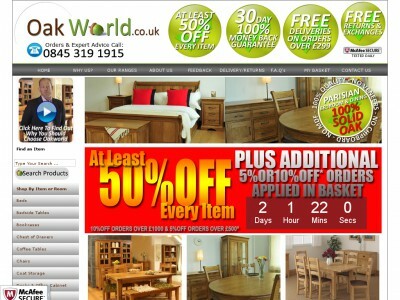 You can use Oak World voucher codes to get great deals on a wide range of beautiful oak furniture at oakworld.co.uk. I used my Oak World voucher to get an unbelievable price on a beautiful extendable table that can seat up to 8 people. So if you're trying to decorate your dream home, see what you could save with an Oak World discount code.